Ryan’s trajectory has been as unpredictable as it has been interesting. Disillusionment with aerospace engineering and existential confusion led him to Zen Buddhism, France, more Zen Buddhism and the pursuit of bicycles. 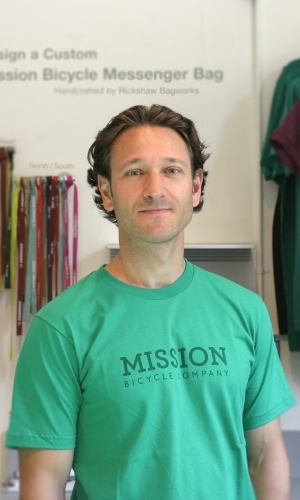 He found a home and a community in San Francisco, and has been advocating for cyclists by riding and volunteering ever since. Ryan began his life with bicycles by falling off them as a kid in West Virginia. Like all of us, he knew to get back up and try again. That determination has served him well over the years as he’s helped put satellites into orbit or taught English in Central Asia. Ryan loves clean air and is a champion cheapskate, but he rides for the passion of being connected to all the space between each beginning and each end. Ryan is a logistics wizard. He works with our entire staff to define our needs and shepherd necessary projects to completion. He’s calm under all pressure and eats his lunches with bamboo utensils. Ryan is the only staffer who has played in a steel drum band.